The penultimate show of the Lovers Again Tour arrives to Pigeon Bay on Saturday May 2nd for an evening of eccentric and soul folk! Monty Bevins & Fraser Ross will perform down in the Pigeon Bay Hall located on Wharf Road near the end of Pigeon Bay Road. 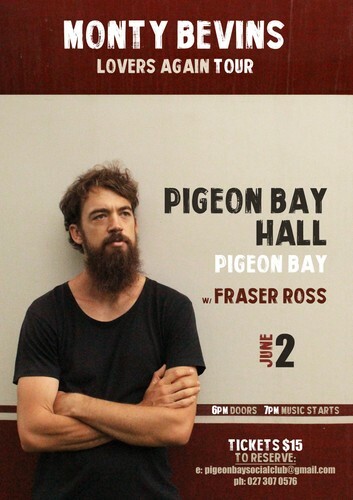 Tickets reserved from pigeonbaysocialclub@gmail.com or 027 307 0576. For more on the Lovers Again Tour head to the website.